With the Super Bowl just around the corner, it was time to share some of our favorite game-day recipes. Anyone who has ever been to a Super Bowl party knows it is as much about the food as it is the game…and beer. The obvious choice for your preferred cooking apparatus is the grill, but cycling food off and on the grill can keep you from enjoying your party or the game itself. Unless it’s your team on the grid iron or it is a none stop “da na na, da na na” fest on the field, the food can make all the difference for a truly awesome Super Bowl party. I wanted to talk a little bit about how grilling with wood can up your game day skills, and make life a little bit easier while doing it. This year the hosting duties for the annual Super Bowl party have fallen on my shoulders. I have been talking with our wonderful staff at Wildwood Grilling about how to make sure what comes off my grill is blowing minds with flavor, but not making me lose mine. I am ashamed to say that I have limited space on my grill, so the option of doing everything in one masterful run is sacked! (I will try to limit football puns, but limit only) The answer is prepping some planks! The two keys to these three crowd pleasers is an unforgettable taste, and ease of prepping large amounts. All three can be grilled or oven planked so space in either location is of no concern! To start, I can pre-season and sauce all of my chicken wings. I will be cooking these in the oven, as it will allow me to use the same plank over and over again and save space on my grill. Let’s call it my star running back of the day. Set my oven to 400 degrees Fahrenheit, and I can keep churning out wings while keeping the ability to enjoy the game. On a side note, I would recommend soaking your planks for a longer period of time for these next two. Having a longer soak on your grilling planks will remedy flare-ups, and give you more time away from the grill. 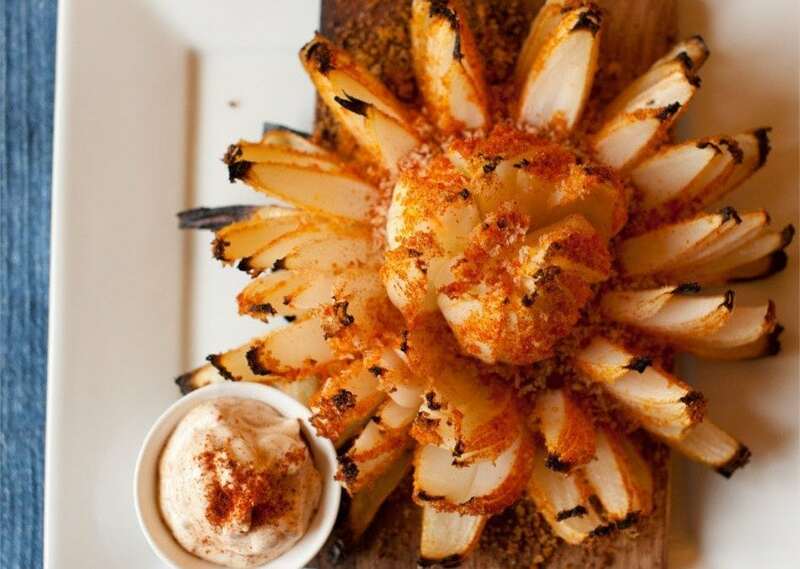 The Red Oak Planked Blooming Onion is going to be my starter, but I won’t be surprised if I still need it around for the end of the game. It’s easy to get multiple onions set, and I can throw another on the grill any time the party supply is starting to dwindle. This dish is sure to please the taste buds and the eyes. It is my way to insure everyone is sticking around for the second half. Now no Super Bowl party is complete without one of the grill out essentials. There will always be the great debate of burgers vs hot dogs, but in this case dogs will have their day. You can’t go wrong with a delicious all-American favorite you can keep cranking out till there isn’t an empty belly in the place! Maple Planked hot dogs are my secret weapon. A new spin on the old favorite and with very little effort will bring the house down! Preheat that grill to 400 degrees Fahrenheit, and cut the hot dogs down the center. All I have to do is toss down my soaked maple plank and place the dogs cut side down. Close that lid to infuse all that smoky maple flavor, and BOOM! Hot dogs no one can say no to. With my well planned condiment bar, and a couple of killer dipping sauces (a little Sriracha mixed with ranch and one with mayo) and my team is set for game day. I will stock my fridge and every cooler with a great selection of tasty beverages, throw on my favorite jersey, and enjoy the party! Hope this helps you get out of the kitchen or backyard and in front of the big screen. Hey Everybody! My name is Nate Adam, and besides being a grilling enthusiast and general grill-master, I am also the host of Wildwood Grilling’s podcast, Forest to Grill. I figured with the Super Bowl coming up quickly, it’s a great time to share some of my favorite Game-Day recipes and grilling tips.